We had my favorite thing yesterday for lunch. 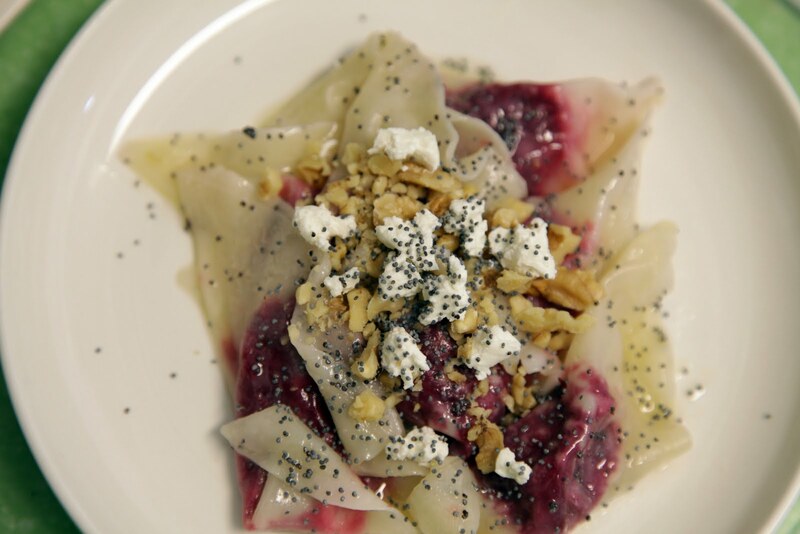 Roasted Beet ravioli with poppy seed butter. It's been a while since we've made it, long enough that I couldn't find the recipe and had to call my little sister, the one who introduced me to such exquisite-ness. I love having girls. Although I don't have boys to compare, I love how they love to do what I do. This weekend Pearl whipped up a sewing project for Olive's birthday coming up next month. When I started making the ravioli they all clamored to help. Even Clover pulled up a chair and began smearing egg wash over the wonton wrappers, then proceeded to shake her hands in the air, flinging the liquid who knows where. My little helpers, sometimes more little and less helpers, crowded around the table getting their share of work in. Heavenly, I tell you. The help and the grub. 400ø oven. 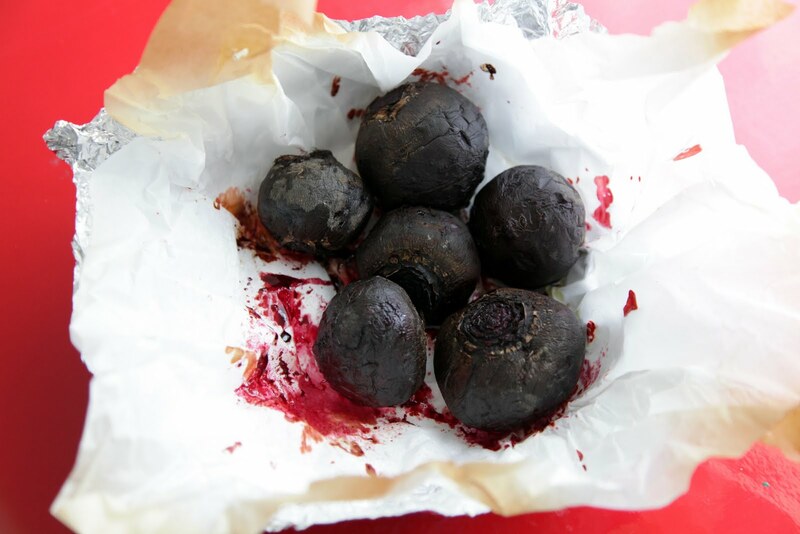 Roast beets wrapped in foil (and I also used parchment paper) about 1 hour on baking sheet until tender when poked with knife. Let cool, peel, and grate finely in bowl. Add cheeses and season to taste with salt, pepper, lemon zest and toasted walnuts. Stir in breadcrumbs. 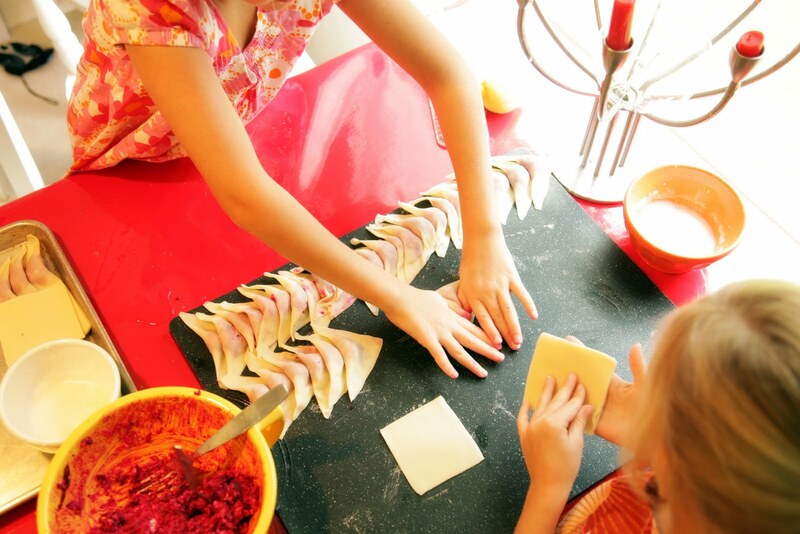 Use wonton wrappers, brush the entire wrapper on one side with beaten egg white/water mix, fill with about 2 teaspoons of filling, fold and seal. Boil in salted water for 3-4 minutes. 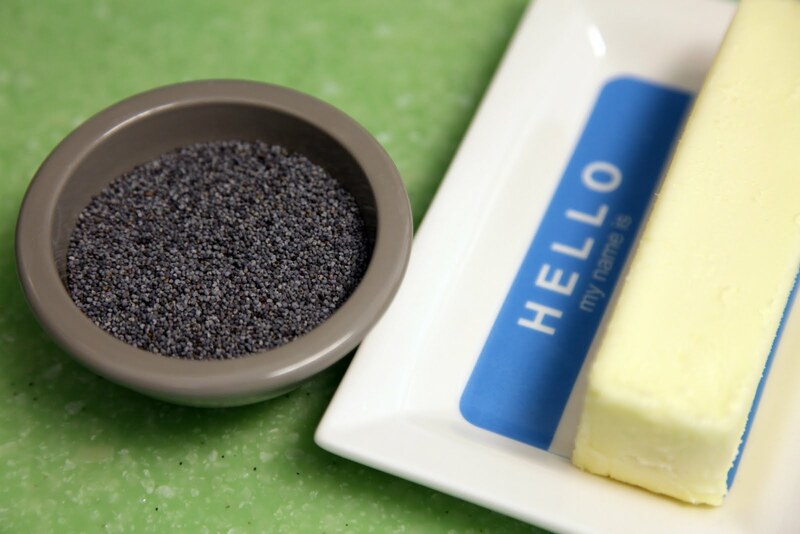 Melt butter in large skillet over medium heat and stir in poppy seeds, keep warm. Toss with ravioli and sprinkle with cheese (and I also added extra nuts and poppy seeds). If you use unsalted butter, I would suggest adding a bit of salt to the butter as well. Saturday night I re-learned how to crochet! Yes, the nesting kicking in again. I learned when I was in elementary school and just made lopsided squares and rectangles. This time I decided I needed to make this newest little one a blanket. I have now advanced to a lopsided blanket, probably. The first several rows I managed to add stitches, but I think I've finally evened out my rows. I'll let you know how it turns out in the end. The extra set of legs are Pearl's. She has to be close. To anyone. She doesn't even realize she's doing it, but if you happen to stand or sit next to Pearl anywhere, you'll soon find her weight leaning against or on you. It's one of those rare guarantees of life. Even though claustrophobia has humorlessly set in with the summer months and the cantaloupe around my midsection, I try to enjoy her need for closeness. Oh my!! That looks delicious! Hungry now! The full grown watermelon around my mid-section is begging for some of that ravioli! Your Pearl sounds so much like my second daughter. She is just the same...and like you I try to appreciate that weight while my temperature rises and claustrophobia threatens. Super-cute butter dish. And your photo wall beyond those pairs of legs...fabulous. I love Pearl's need for closeness. We have a dog with that velcro personality! Aren't girls the best!? I've only got one little two year old right now, but I adore how she loves to help me cook and sew already. I've got another one on the way later this year, and I'm really hoping for more pink! Oh Katy, my Abby is just like Pearl. Always draping or leaning, or hugging. So loving. Long and lanky too. I have never heard of anything like this recipe, but it looks really yummy! I have two teenage boys and two little girls. 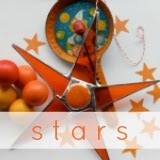 They all love to help with the cooking and creative projects. I think they just like participating together as a family. Looks like a fun recipe! No wonder this is a family favorite recipe! It sounds heavenly. I have a confession to make...I just adore you! You have the sweetest family and the very same joys as yours truly. Just today, I had mentioned wanting to make ravioli with my kiddos...and last week, I wanted to relearn crochet(the yarn tangles are such a bugger!). You are a true gem...Cheers! This looks fabulous! I can't wait until it cools down enough for me to turn my oven on for an hour. I also shared this with my fellow CSA members. I love the last photo of this post...too cute! I also love how you described it in the paragraph underneath it. Just so sweet! Hello! I just found your blog, noticed you are a katy with a *y* too and wanted to say a great, big, merry *hello*!!! Mmmmmm. Tried this last night and it was delicious! Soon to be a regular around my house. Even my picky - must have meat or it isn't a meal - husband liked it. I just made this for myself and 1 1/2 yr-old twins. They loved it! They helped pick the beets from the garden but weren't any help in the kitchen. I'm just glad they've got good taste. Thanks for the recipe!